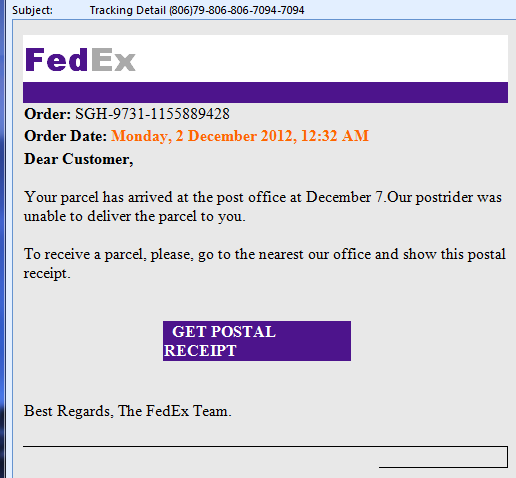 This Spam Email is from Fedex – NOT! Here is another example. Read about the first here. There’s usually a flurry of mails like this around Christmas. People can be taken in more easily if they’re expecting a delivery, as many do at this time of year. The format of the “Get Postal Receipt” button, which looks very unprofessional. If you feel public-spirited, and it claims to be from an organisation, search for what they want you to do about spam. Fedex has a whole micro-site about spam, which makes useful reading. It contains examples of common spam emails. Finally, here’s a page with how to report spam to lots of major organisations. Thank you Marjolein Katsma. This entry was posted in Wider Internet Issues and tagged anti-spam, Fedex, hacker on December 19, 2012 by Dave Fielden. An Email from Facebook – Not! It looks quite Kosher, but I always check mails that want me to click on a link to a website. Just as well! It wasn’t going to send me to Facebook al all, but to somewhere else entirely. Actually www.hausfrisia.de is the web site of a holiday villa, but not the page in question. A hacker has hijacked their site, or their DNS. This happened to a small business in Portishead earlier this year. Read about it here. CHECK BEFORE YOU CLICK – even if you recognise the sender. It may be too late afterwards. Remember, the better-known the sender, the more likely they are to be imitated. 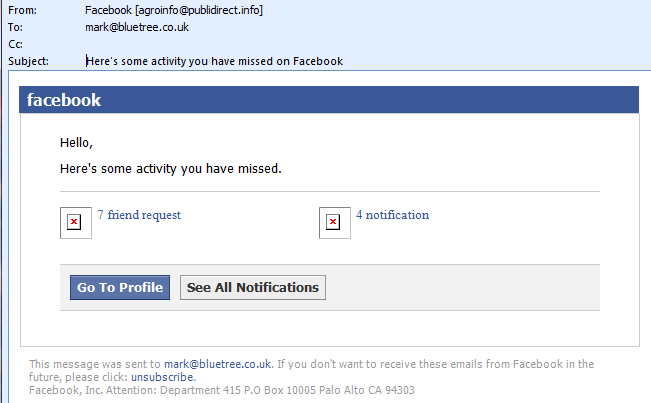 Check the From address, in this case it’s, Facebook [agroinfo@pub….rect] agroinfo? Isn’t that enough on its own? Hover on the link, DON’T CLICK, and check the target web page address. In Outlook, example right, it appears in a small window, but Thunderbird displays it in the status bar at the bottom. Is the link plausible? In this case, NO – it’s nothing like Facebook! Still not sure? Check all the links. If they all go to the same web page then get suspicious. If you’re happy, click that link. If you’re not, mark it as Junk or delete it NOW. If it’s from someone famous, as this one is, search for what to do. In this case, I searched for facebook notify suspicious email. I found this page on the Facebook site, which asked me to forward the mail to phish@spamreport.facebook.com. Another example arrived today, apparently from Fedex. Read our post here. This entry was posted in Wider Internet Issues and tagged anti-spam, facebook on December 13, 2012 by Mark Fielden. Have some local fun, out and about on the Internet! Maybe even win a prize! 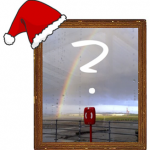 Sixteen photographs, all taken in Portishead, sit on a web page. All you have to do, is wander round the town with a print-out, smart-phone or tablet, and answer a question about each picture. The main thing is to explore parts of the town that you maybe haven’t seen before. The quiz runs for the whole of December, so there’s plenty of time. Couch potatoes may be able to get some of the answers on the Internet, but not all of them … we hope! Perhaps there are long-time residents like us who have never walked around the Marina, too. So, we thought it might be nice to encourage new residents to look around the old parts of town, and old Possett people to pluck up the courage and enter the new. Hope you like it. www.bluetree.co.uk/quiz. 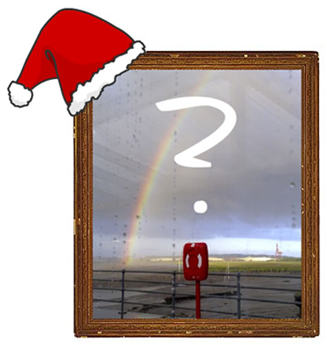 This entry was posted in Wider Internet Issues and tagged portishead, quiz, smart phone, tablet on December 1, 2012 by Mark Fielden.